We are moving into a new home in October and would love to freshen up the paint pallette. Love the new chairs!! I’ve been wanting to repaint our master bedroom, that’s definitely what I would use the paint for if I won! It’s just a regular beige right now and I’ve been wanting to go dark, like a slate grey/blue. I am so excited to give Gliddens a try, will be using it in the Bathroom/Laundry Room. Full remodel job this fall, have heard so many wonderful times about the paint. 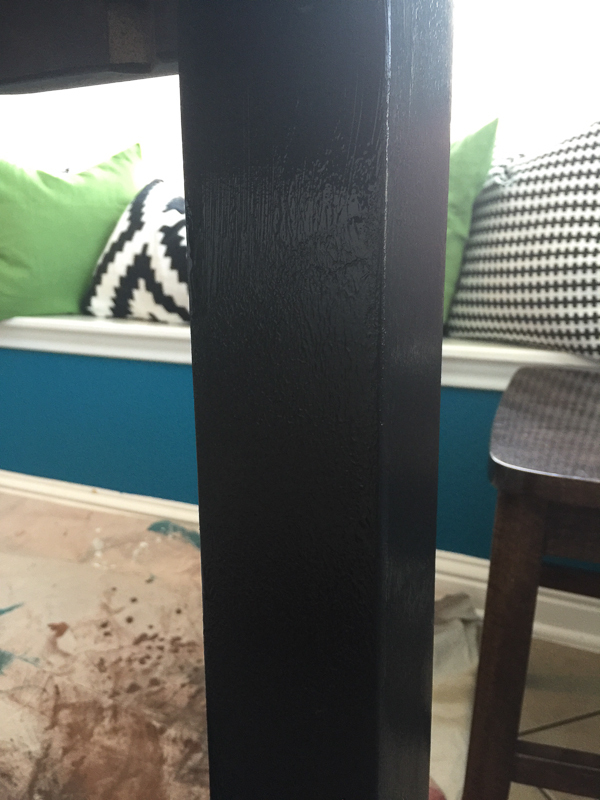 Hi Lindsay, I’m loving the Diamond paint & primer and the way you showed how it leveled out. Roadside score some months ago that needs a few coats of this paint to eventually become a lovely linen closet w/glass doors. Your table looks great. This is so exciting. I need to paint two bathrooms, my kitchen, cabinets, family room, office, bedroom, and front door! This would be very helpful! I would paint my kitchen table just like you did. I would use the paint in my new living room. We have been in our house for 1.5 years now and I waited to paint because I wanted to be sure…now I want to paint ALL THE THINGS!! This giveaway would really help:) thanks for the chance! This makes me excited! I just bought Glidden Paint in Lindsay “White” at Home Depot for the first time to paint our kitchen cabinets. Of course I did get the strange look when I asked to have the white made white-er. 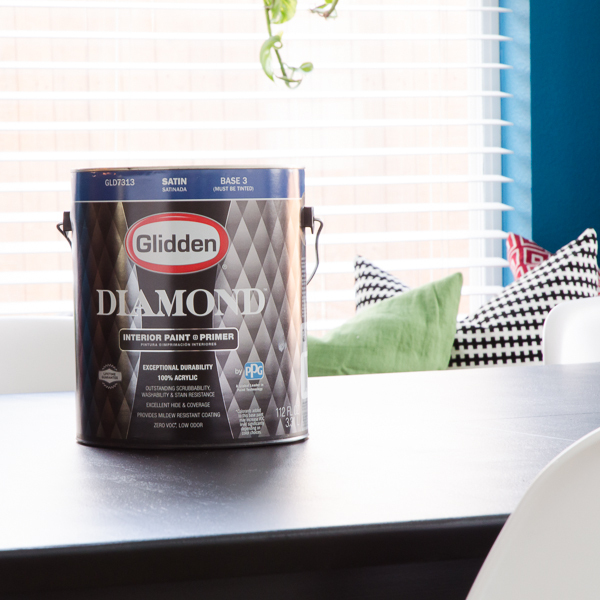 I use Glidden to mix my own chalky paint all the time so I’m anxious to try this new Diamond! My kitchen needs a rehab. Cabinets need paint. Would you share your source for the chairs? OOO, AAAAHHHH!!! Your table looks gorgeous. I’m wanting to repaint my craft room furniture, so this might be the easiest to use since it is primer and color in one. Kim in Round Rock. I have so many things to paint: the front door, the kitchen, the entryway — five coats might cover those tasks! Holy cow!! It really did flatten out nicely!! Thanks for the visual proof, because I would have wasted time fussing over it trying to get it to look better wet. And the temperature sounds like my kids last soccer game… on turf… just a few degrees short of the surface of the sun!!! It’s always great to see your posts! I’m really thinking of taking the plunge and painting my kitchen cabinets, something like a muddy, grayish olive color. This paint seems like it would be perfect for that!! Thank you! I would use it in the dining room so I wouldn’t see so many little fingers after meal time. I have an old armoire refashioned into a shelved pantry that could use an update. 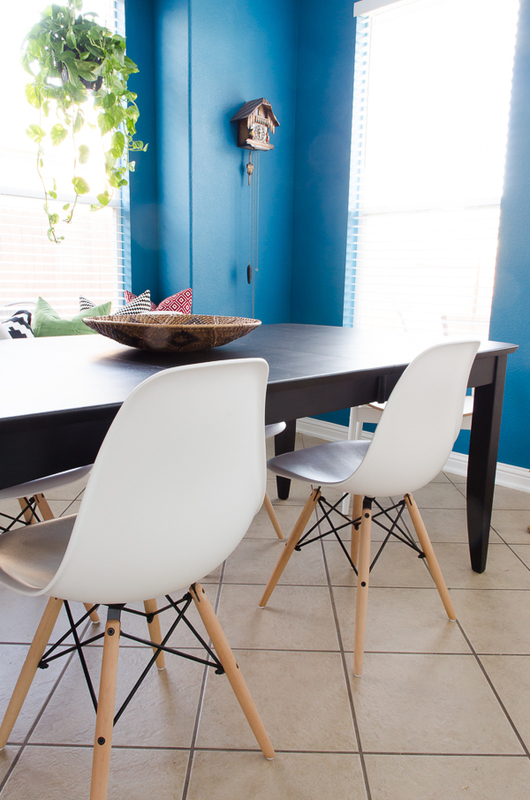 This Glidden would be perfect! I really like the look of the table. 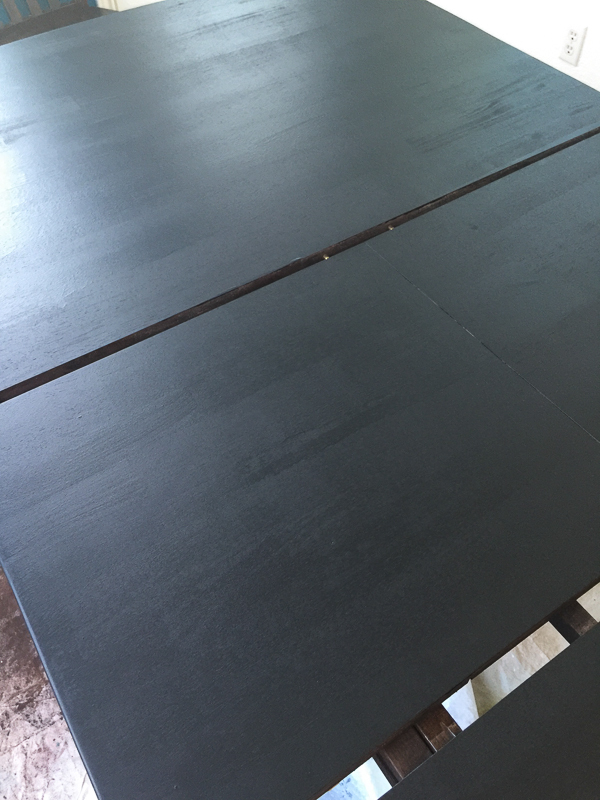 My question is did you do a poly top coat to the table for more durability. I just painted a set of kitchen cabinets in my kitchen with the Glidden Diamond paint in Oriental Berry. I love the paint but am wondering, if a poly coat is needed or not. 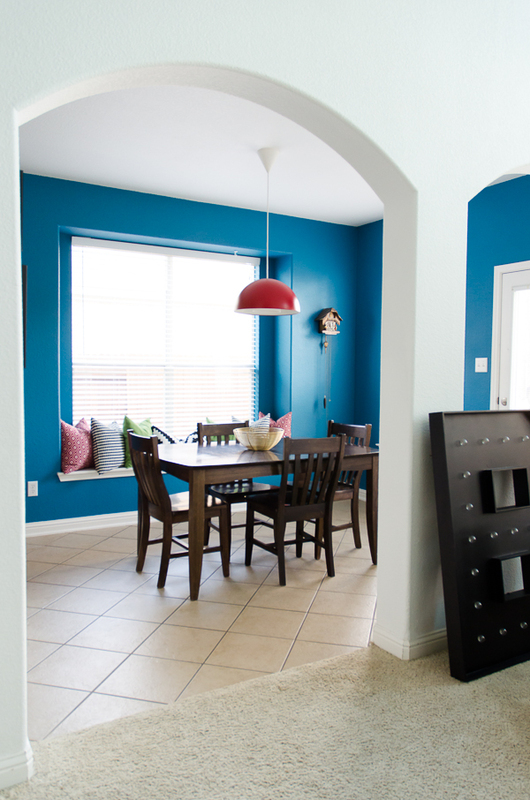 I’d love to repaint my family room! I am semi-finishing our basement and this would be perfect to paint the walls. You make it look so easy. That point about self leveling laint was gold. We would use it in our bathroom. We are converting an extra bedroom into a playroom, so I would use this paint for that. I’d paint our coffee table/breakfast table! I am in love with the paint and the primer. I am definitely using it for my kitchen renovation. Wow, so smooth! I love the new finish. I’ll definitely consider it for my daughter’s room, it is in a desperate need of a freshen up. Thank you for posting it! Wow so gorgeous! 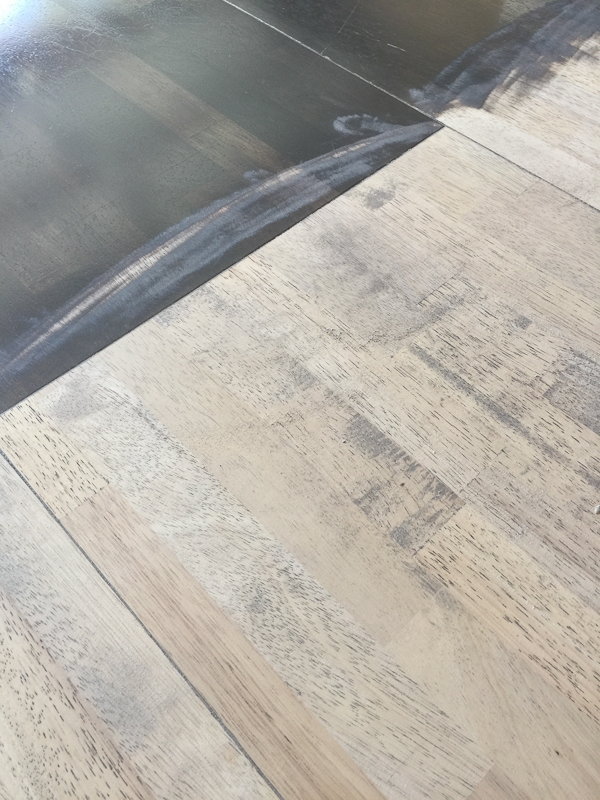 I love dark wood in kitchens, it’s the only room of the home where my skirting is painted a darker colour than the rest of the house. Lindsay, I loved your website, the designs are beautiful and they gave me wonderful ideas, thank you very much! Wonderful kitchen! Your table looks new now and it’s beautiful. Its dark color complimented the overall look of your kitchen. Thanks for sharing this to us. Thumbs up! 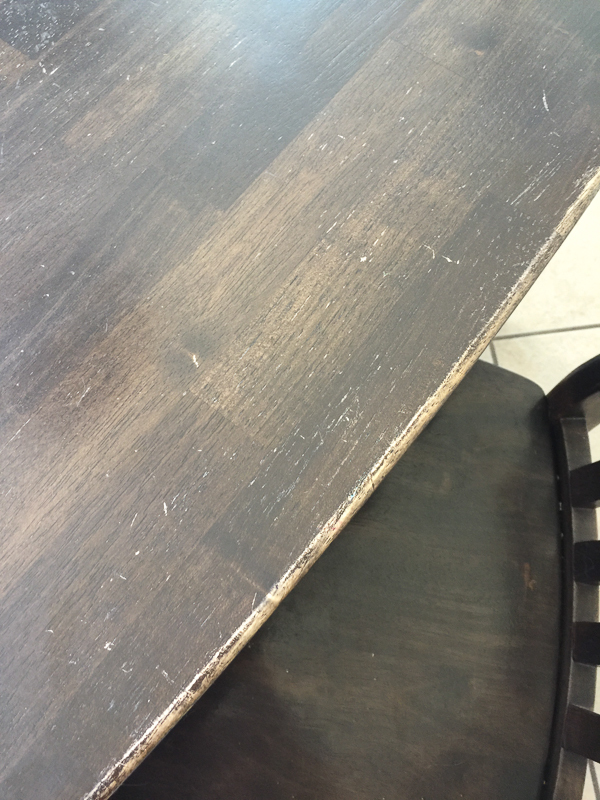 Congratulations Lindsay, your table was beautiful, I will follow several tips from you and enjoy to restore and give new face in some furniture here at home, thank you. Your table was wonderful Miss. Lindsay, did a great job, thank you for sharing your art with us. Really like your layout of images which you shared. Thanks. It was beautiful! I’m also going to remodel my kitchen and I love the tips! It looks very beautiful, like new. I should paint my living room and hope I have the same result. Thanks for the tips! 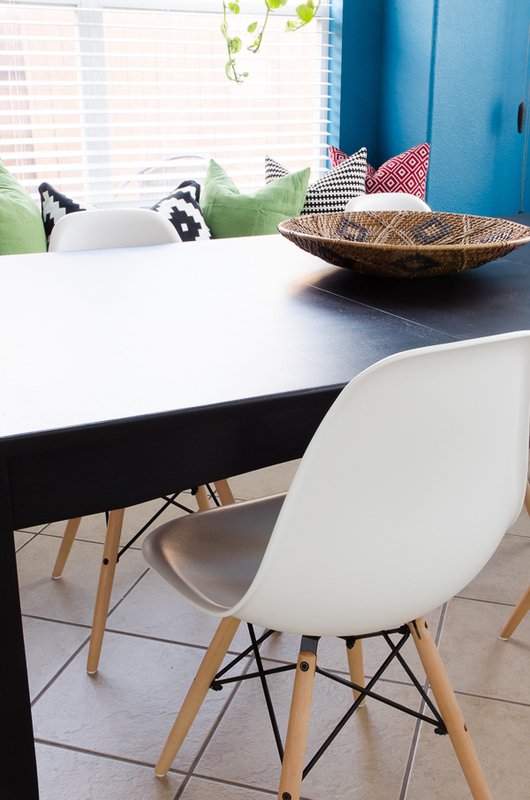 Your kitchen table is wonderful. Lindsay, what a change, and she was very stylish, too. Congratulations. realmente muito interessante. Eu provavelmente vou voltar a ver. Este Texto me convenceu de uma coisa, eu absolutamente acredito que este site precisa de muita atenção por parte das pessoas, porque é realmente muito interessante. The table looks like a new one. This has been done beautifully. These are look so adorable!! I really like their style, so I’m definitely making some for my home. Thank you for the details! Our new home will looks great. 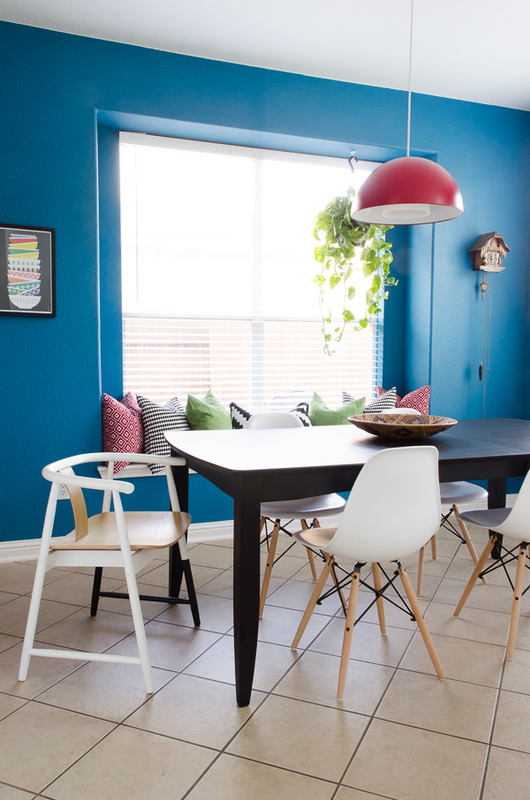 We’re also using the same blue color for the wall of our home. It looks amazing. You did a great job. + 5 Gallon Paint Giveaway. Good web site and therefore magnificent content! an unique experience in re-writing. Do you write most guideline and also techniques to those people would like improve own writing skills? unique types for school and then universities and colleges . I like this renovation I will definitely used this in my house. Adorei as peças, são todas lindas! Really like your layout of images which you shared. Thanks very much. Wow, how beautiful! really with this painting are looking new. I loved creativity! Great post. I also have some furniture in need of a remodel, I will try to find out more about this paint. Really GORGEOUS! Thank you for the tips. 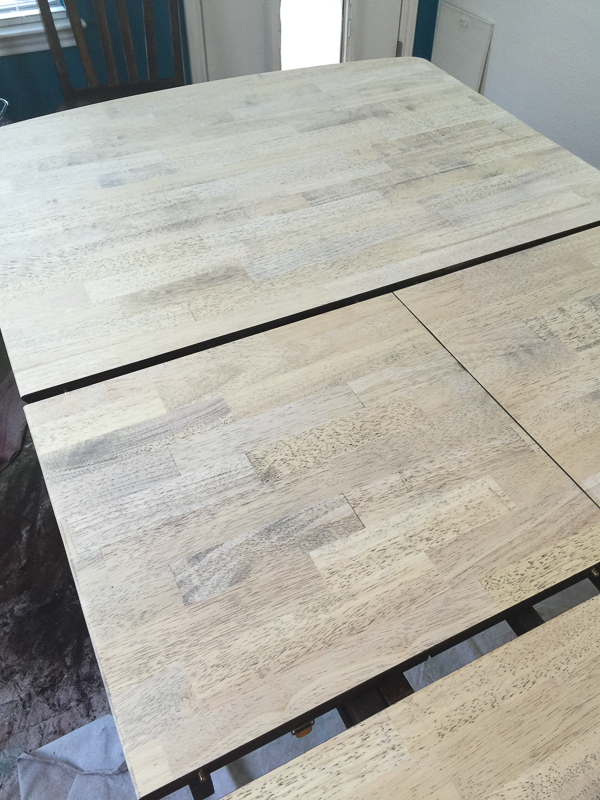 Very well explained step by step process of turning an old table into new one. Looks very good.No one can say it was an old table painted to a new one. will apply this to my dining table. I like this site too much, you develop an excellent work, they differ, congratulations. Este site é uma maravilha, sempre me encanto com as postagens, parabéns pelo excelente trabalho. It was simply fantastic, congratulations. Wonderful giveaway…! Very well explained step by step process of turning an old table into new one. Looks very good.No one can say it was an old table painted to a new one. will apply this to my dining table. nice deatials for home desgin amazing more work in sites. WOW! I like this too much. I’m also going to remodel my kitchen and I love the tips! I found another post, they have some kitchen cleaning tips could anyone tell me will it work? What a great idea and tips you shared. Loved this picture. What a color combination! It looks great combination and great. Thank you so much for sharing this post. Love this post! 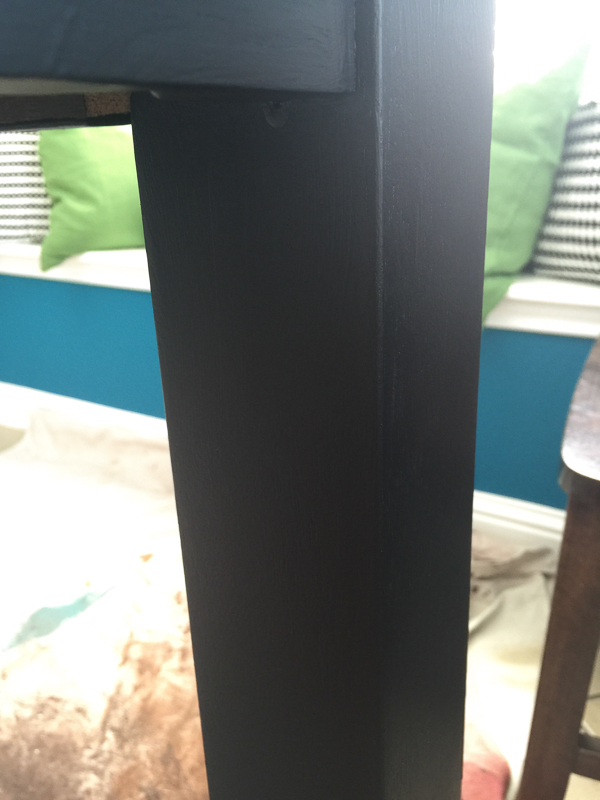 It’s amazing how a simple act like adding a layer of paint really makes a difference. I work for The Handy Squad and people are surprised how by simply jet washing their wooden table we breathe life back into it. The same principle applies here with this table. Take care, Luke.